First standing row; Acting Sub Lt. Somphop Konkaew, Chief Executive, Thepkrasattri Subdistrict Administration Organization (5th from left); Mr. Veera Kerdsirimongkol, Thalang Chief District Officer (6th from left); Mr. Sitthichai Chantawut, Chief of village Moo 4 (7th from left); Mr. Anthony Loh, Senior Assistant Vice President of Laguna Phuket (8th from left), together with Laguna Phuket’s management and associates took a group photo with members of Baan Don village at Thepkrasatri Temple. On Monday 5 October, Laguna Phuket together with executives, associates and Baan Don Village members had joined in Baan Don’s Sart Duen Sib (Ghost Festival) parade at Thepkrasatri Temple. This festival is a southern tradition for Buddhists to make merit in remembrance of loved ones who passed away as well as the local heroes who sacrificed their lives. 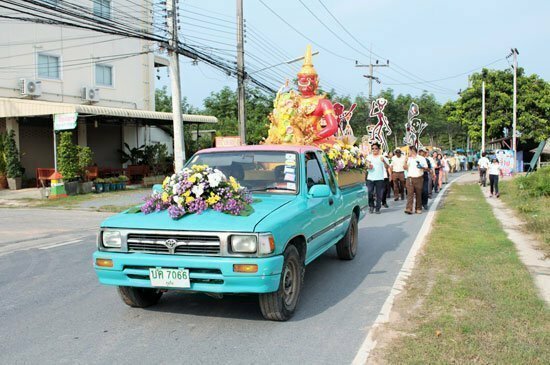 Laguna Phuket parade on the way to join the main parade towards Thepkrasatri Temple. “Laguna Phuket places importance in community engagement and cultural preservation. I am glad to see our associates and Baan Don Village members come together, all smiley and for good cause” he concluded. The red guardian giant plays centre piece of the parade. 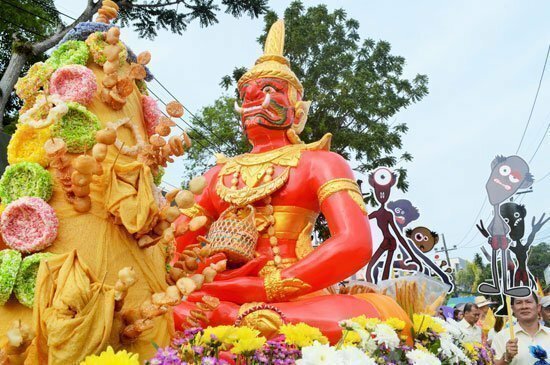 The highlight is the full-of-life parade from Laguna Phuket with a Red Guardian Giant sculpture, brass band and a banknote tree of donation collected from Laguna Phuket associates and community members.